Often thought of as a grain, quinoa (“keen-wah”) is a seed from a weed-like plant called goosefoot. 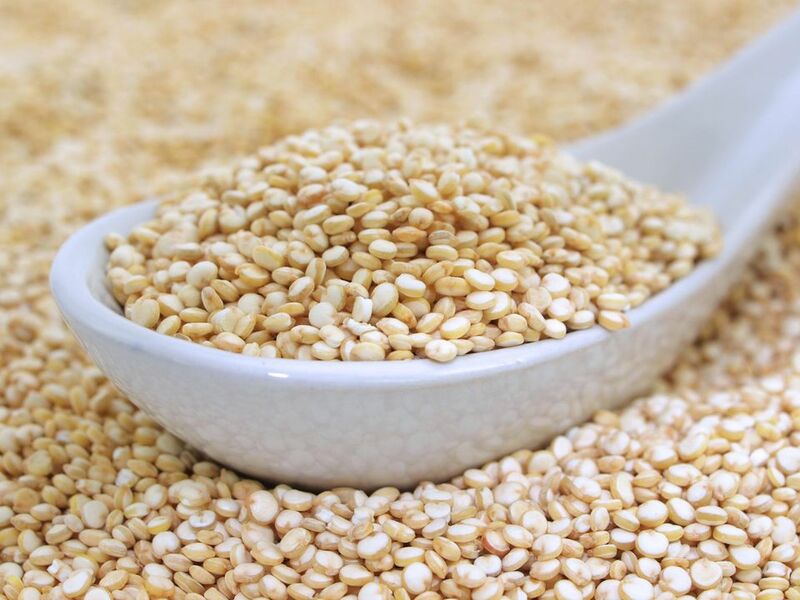 Although not a true grain, quinoa shares similar nutritional properties and generally cooked and served like most cereal grains. Quinoa is small, granular, slightly chewy when cooked, and has a slightly nutty flavor. Quinoa is a favorite of vegetarians and health enthusiasts because of its high protein content. In addition to being higher in protein than most grains, quinoa is also a complete protein source, with all nine essential amino acids, which is rare in plant products. The unique protein content of quinoa made it an important staple food in the diets of prehistoric South Americans. In addition to being an excellent protein source, quinoa is also high in fiber, minerals, and B vitamins. One cup of cooked quinoa contains 222 calories, 39 g carbohydrates, 5 g fiber, 8 g protein, 4 g fat, 15 percent of the daily value for iron, and is also a source of magnesium, vitamin E, and calcium. Quinoa is naturally gluten-free, making it a desirable alternative to pasta and for whole grains that contain gluten. Quinoa is coated with natural substances, called saponins, that must be rinsed away before cooking. Most commercial varieties of quinoa have been pre-washed to remove the saponins, but always read the package labeling to make sure. Saponins taste bitter and can have a laxative effect. Once the saponins have been washed away, quinoa is cooked in the same manner as rice. Quinoa is usually cooked with water, two cups of water to every cup of quinoa. Quinoa can even be prepared in a rice cooker for convenience. It cooks faster than rice and is ready within 15 to 20 minutes. Using stock, broth, or seasoned water to cook quinoa will add flavor to the finished product. Quinoa can also be sprouted and eaten like bean or alfalfa sprouts as a topping for salads and sandwiches. Popular ways to use quinoa include using it instead of rice in recipes, with the cooking time adjusted. It can be used in cold salads as well. Quinoa is a popular item in health food stores and is often sold in bulk. In grocery stores and supermarkets, quinoa availability is more limited but may be found near specialty rice, beans, and other grains. If there is a special gluten-free section in the market, look for it there. Quinoa should be stored in a similar manner to rice and other dry grains, in a cool, dark place, in an air-tight container to keep out moisture and insects. Once it is cooked, it can be kept in the refrigerator for five to seven days.